Mitsubishi i-Miev price drops by 10k | What Car? 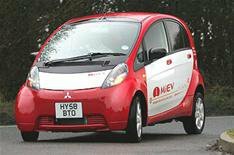 Mitsubishi has reduced the price of its i-Miev electric car to 28,990, which drops to 23,990 when the Government's 5000 electric car grant is taken into account. Although the car won't be on sale until January 1, 2011, it had previously been priced at 38,699, almost 10,000 more than the revised figure. At 23,990, its priced the same as Nissan Leaf, which goes on sale in February 2011. The i-Miev comes with a 49kW electric motor that can power the car to a top speed of 81mph. It has a range of 90 miles and takes nine hours to charge, although a rapid charge system can recharge to 80% of the batteries' power in 30 minutes. The i-Miev comes with a five-year, 62,500-mile warranty for the main battery and EV components. A three-year servicing package can be bought for a further 300.